Swansea City showed that they’ve still got a lot to learn today after throwing away what looked like a certain three points at Rotherham United after conceding two penalties to give the home side their first win in 9 games. Graham Potter’s side dominated the first hour as Rotherham didn’t really have a look-in all game. They were second-best for the most part and we were well worthy of a 1-0 lead after McBurnie’s converted Dan James’ cross after 25 minutes. But like we’ve seen in previous games this season, we looked overly comfortable at just 1-0, with the urgency to create chances to guarantee the win and three points reducing as time went on. In a crazy eight-minute spell from the 79th minute, Rotherham suddenly came back into it thanks to a stupid error from goalkeeper Kristoffer Nordfeldt. The goalkeeping situation will now be under the spotlight once more as the Swede pulled a player back in the box as he attempted to deal with a bouncing ball. He never looked convincing as the ball came over and towards the six-yard area. But Kyle Naughton was covering and had the situation covered but even so, Nordfeldt felt the need to pull the Rotherham player by the shoulder and the referee rightfully pointed to the spot. The second penalty wasn’t quite so clear-cut as the first. A powerful shot was curling wide of the target and hit Leroy Fer flush in the face but the midfielder had raised both hands to cover his face and the referee felt the need to point to the spot once again. Max sums it up well below. Surely handball is when an advantage is gained by the ball hitting the arm, yet in this instance, the ball would have simply hit Fer’s face had he left his arms by his side. Prior to the madness towards the end of the game, it was a confidence performance from the Swans but it’s not the first time that we looked overly confident and relaxed with a slim 1-0 lead. It was similar to the home game against Ipswich. We went 1-0 up, relaxed, and then suddenly found ourselves 2-1 down, and following the equaliser, we conceded again. Wigan away was also similar, although we didn’t take the lead, we looked overly relaxed as we dominated possession but as Wigan came back into it, we did risk losing a point and you could also strongly argue that it was a game where we dropped two points. Unbelievable that, over confidence and thought we were coasting to a 1-0 win. Can't disagree with the pens although the Fer one was odd. Celina was releasing Dan James down the left countless amount of times in the first half but the final ball just wasn’t picking out McBurnie until we got it all right after 25 minutes. Celina, himself, had a one on one chance to make it 2-0 but he gave the goalkeeper time to race out and make a decent save. Leroy Fer’s chance within three minutes of the restart really should have seen us double the lead. The ball was pulled back to the midfielder and he had a clear shooting chance inside the box but his left-footed effort was aimed too centrally and the goalkeeper made another good save. We didn’t really create anything of note after that early chance and while we continued to dominate possession and look by far the better side, we didn’t look like we’d go on and get that crucial second goal. Confident, commanding and dominating half that deserved at least a 1 goal lead. Rotherham not really offered anything, got to keep the dominance up in the 2nd. Only weak link I would say is Fer who's lost possession too often in simple situations. It was surprising that Graham Potter didn’t make any substitutions until we found ourselves 2-1 down with just a few minutes remaining. I did wonder if Leroy Fer would make it past the hour-mark as he was our only weak-link in the first-half. He was sloppy in possession and there were moments when we were moving well down the pitch before Fer made a simple unforced error. van der Hoorn and Rodon were both solid and composed as ever at the back and it was a defensive performance that once again deserved an eighth clean sheet of the season. Dan James proved to be the attacking outlet that we’ve so desperately needed since Montero’s last outing at Millwall. McBurnie’s goal was the first we’ve scored away from home when Montero hasn’t been on the pitch and it goes to show how influential the young winger has been in recent games. The most frustrating thing about today’s defeat was the manner of how we lost it and how comfortable we seemed to be despite only having a slim lead. 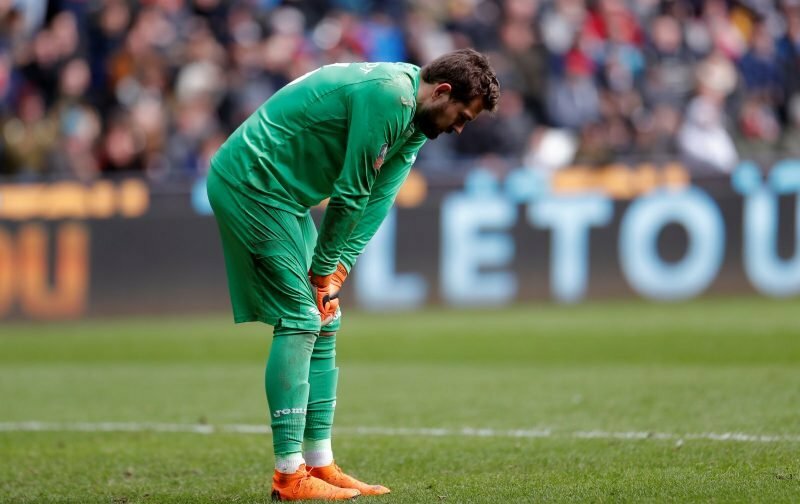 Rotherham might not have had a decent chance in the game with their long-range free-kick being the only tester for Nordfeldt – which was a very good save it has to be said. But considering the type of side they are, who rely on set pieces and long-throws, chances and goals can come out of nowhere so we really need to press better for a second goal. very true. It just had that feel to it right throughout the 2nd half – I just felt like "we've won nothing yet and we're just waiting for the full-time whistle"